True confession: I have not done very much art instruction with my girls. (I haven't done much with Isaac, either, but he's only sort of in kindergarten so I don't mind so much.) Art is one of those "extra" things that only happens when there is "time." I don't have much confidence in my ability to teach it well, either, so most often it slides to the back burner. I've looked at ARTistic Pursuits before, and I have a couple of their books for younger children. When we've used them, the girls have enjoyed them very much. However, they typically fall by the wayside in the name of getting MATH done, you know? I was therefore thrilled, and a bit trepidatious, at the opportunity to review one of their brand-new, updated books. 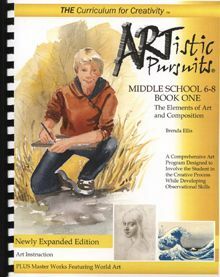 I received Middle School 6-8 Book 1: The Elements of Art and Composition, available for $47.95 from their website, for the purpose of this review. It's a nice comb-bound book, so it lays open easily while we're working on lessons. It's directed at ages 11 and up. Assignments are color-coded in gold, so it's easy to see exactly what they need to do. Students should plan to spend approximately an hour on each lesson. If they do two classes per week, the book will take 32 weeks to complete. The author notes that it is important to schedule art lessons when the student will have plenty of time to complete the assignment, even if it takes them more than an hour. That's a good reminder - it's hard to stop in the middle of a drawing and find your "groove" again when you come back to finish it. The book is written in a lovely narrative style to the student, so my girls have been able to do the lessons without my direct supervision. I had initially hoped to be able to work through it along with them, but it didn't work out that way. They've been doing a great job on their own. The supplies needed for this particular level are simple: drawing pencils and paper, pen & ink. We had many of required items and it wasn't difficult to find the rest. ARTistic Pursuits offers supply packs for each level, which are great if you're not sure what to buy or can't find what you need locally. It also makes it easy to get everything you need in once place so you're ready to start when your box arrives! Because I have older editions of two of the books for younger ages, I contacted the author and asked if they were compatible with the newer editions. She responded quickly, and told me that the content is the same, with some added pages, so older and newer versions are compatible. Good to know! I asked my girls what they liked most about the program, since they've been drawing away without me. My older daughter said she liked that the book was written to her (the student), and that there were specific instructions to follow. She and I are similar that way - we don't respond well when we're told to do "something." We like to know exactly what's expected. My younger daughter liked drawing household objects, and learning to look at things that are around us all the time from a different perspective. She also liked using several different drawing pencils in varying degrees of hardness in her pictures. The first unit talks about space. 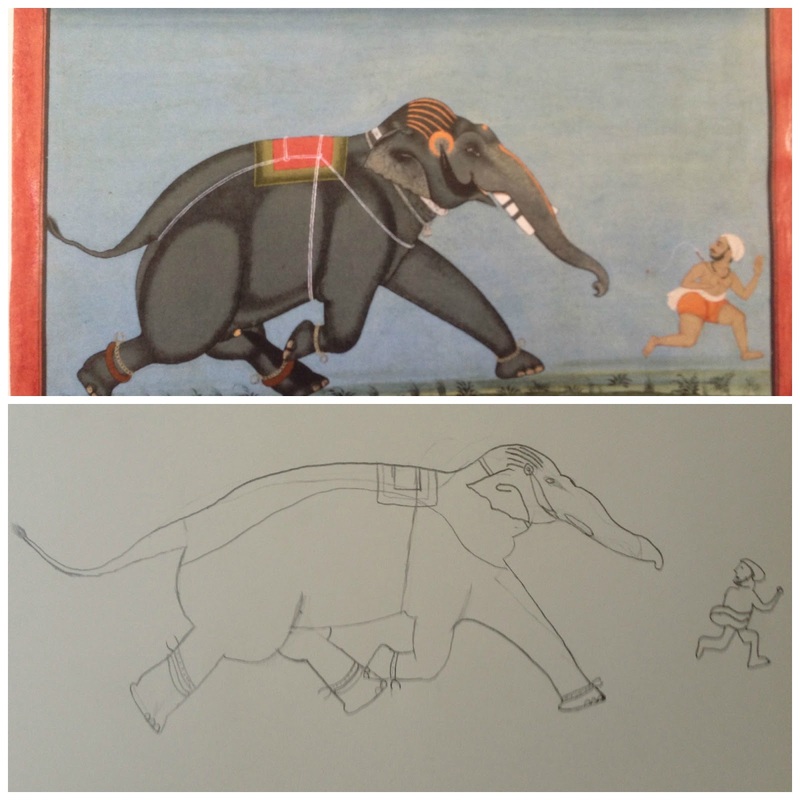 One of the assignments was to draw a quick sketch from a painting, titled "Portrait if the Elephant, Dal Badal, Chasing His Attendant." They were to sketch the picture on a full sheet of paper, and then on a half sheet of paper. They both did the assignment, but my older girl lost her pictures. For some reason she didn't do them in her sketchbook, and they've wandered off. My younger daughter did a great job, though! Check it out! I've seen improvement in their drawing skills in the few weeks they've been using this book. The main thing is practice! With a book to follow and specific assignments to do, they spend time drawing regularly, incorporating new skills along the way. 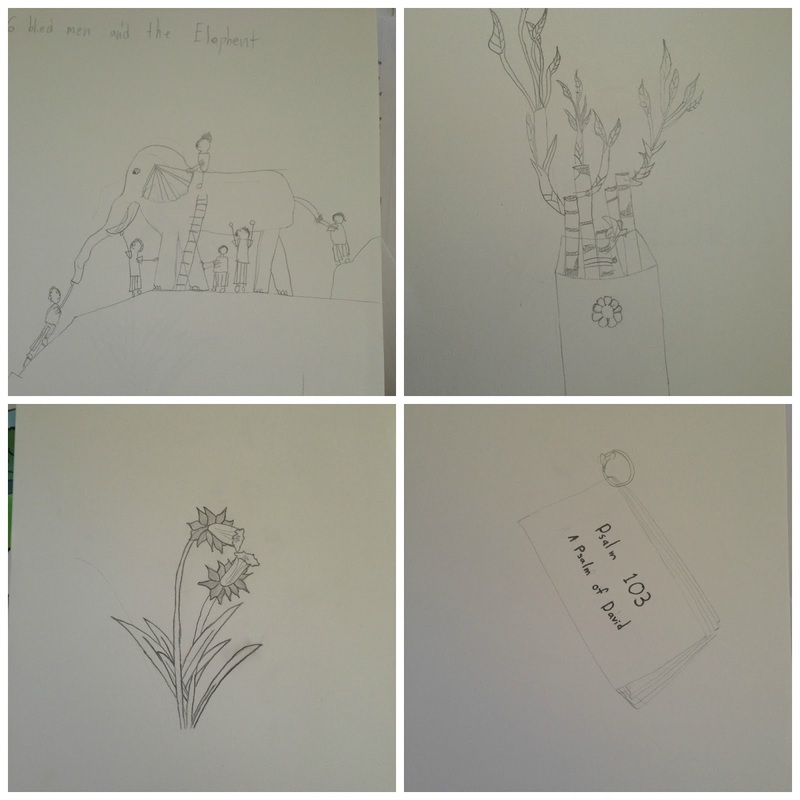 As they've worked through the lessons, they've seen they CAN draw, and their confidence has increased. My older girl would rather not bother with drawing most of the time, but she has enjoyed this book and I've been pleased with her work. My younger girl loves to draw, but is a perfectionist, and has a hard time believing in herself. I've seen her smile over projects she's created over the last few weeks. Probably my favorite thing about the program is that it is teaching the girls to observe the world around them. In our Charlotte Mason homeschool, careful observation is key. Education is relational; all subjects are interconnected throughout Creation, and the only way to find those connections is to observe carefully. I love seeing how much more closely the girls observe things while they're drawing them. I also love that art appreciation is included. We get to see pieces of art from famous painters as well as ones who are new to us, and each one is carefully selected to illustrate the topic for the unit. There is information about not only the artist, but the culture during the time the piece was created. We do have our own artist studies, but I appreciate the exposure to new works we haven't seen before. I love this art book, and plan to have the girls continue working through it. I feel inspired to get out my kindergarten book for Isaac to use, too. ARTistic Pursuits offers art instruction for all ages: Pre-K, Early Elementary (K-3), Elementary (4th-5th grade), Middle School (6th-86th grade), and High School. Don't forget those handy supply packs, which come with a bag to keep everything in one place. As a mom who wants to teach art but doesn't have any previous knowledge, I highly recommend this curriculum. I hope you'll check it out!